It is a real pleasure for me to join you at Tate Britain. I feel honoured to be part of this grand gathering of museum curators and gallery directors. 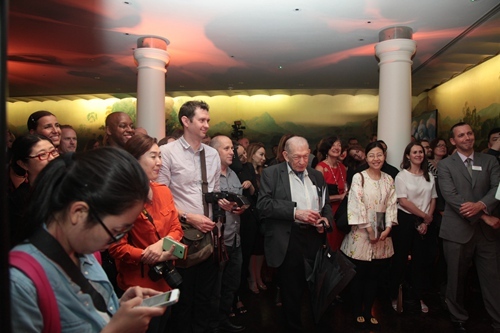 On behalf of the Chinese Embassy, I warmly congratulate the launch of London Autumn Cultural Season 2014. I also thank London & Partners and all those who have contributed to this event. My diplomatic career has enabled me to visit many of the world’s great cities. Based on that experience I think that London can fairly claim the title of being the world’s leading centre of culture and creative industry. London is very fortunate to be the home of a large number of museums, galleries and every kind of cultural venue. Those living in London have the benefit of easy access to many rare exhibits. London also stages a great variety of cultural activities each year. More importantly London has a large contingent of professionals in these sectors. I have worked and lived in London for more than four years. But the cultural life of London never stops surprising me! As diplomats in London, we are both consumers of cultural products and cultural envoys. 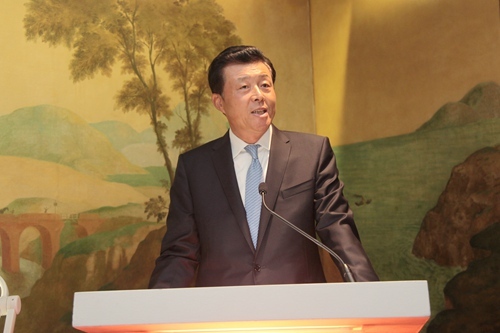 It is an important mission of the Chinese Embassy to promote China-UK cultural exchange and provide cultural products for London and the entire UK. I am very glad to be here this evening. It gives me an opportunity to express my gratitude for the support and help you have given to a number of events featuring Chinese culture. This has been a most valuable way to introduce Chinese culture to the public across the UK. · The Masterpiece of Chinese Painting 700-1900 at V&A museum early this year. · The Chinese New Year Celebration at Trafalgar Square. · The exhibition Ming: The Golden Empire at the National Museums of Scotland in June. · And the concert performed by the Chinese Philharmonic Orchestra at Royal Albert Hall as part of the BBC Proms in July. These events not only display the achievements of ancient Chinese culture but also present a live picture of modern China. In this coming September, China features as one of the highlights of the London Autumn Cultural Season. This is the exhibition ‘Ming: 50 years that changed China’ at the British Museum. This exhibition will show a rare collection of porcelain, jewelry, paintings and furniture. These treasures are from between 1400 and 1450 which was the zenith of the Ming Dynasty. Many of them are shown out of China for the first time. The Great Wall that spans northern China. The Forbidden City at the heart of Beijing. The Yongle Encyclopedia, which is described in Encyclopedia Britannica as the world's largest known encyclopaedia. Three of the four classic Chinese novels. And the seven sea voyages by Admiral Zheng He that reached as far west as the shores of Africa. All these have created a lasting cultural legacy that runs through the collective memory and identity of the Chinese nation. Reliving those glorious days will help visitors gain a deeper understanding of ancient China. It will also give visitors a better reading of today’s China. We should never cease to admire culture. Then we can apply what we know about a culture to increasing mutual understanding, broaden common ground and expand cooperation. I have no doubt that the exhibition Ming; 50 years that changed China will play a big role in all these aspects. This exhibition will also lay a good foundation for the 2015 China-UK cultural exchange year. In conclusion, I wish London Autumn Cultural Season a great success! I look forward to many more excellent cultural events in London and more splendid chapters in China-UK cultural exchanges!